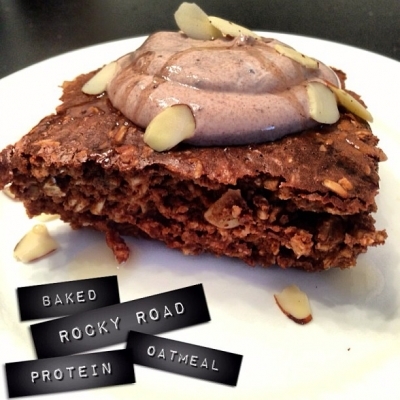 Rocky road baked protein oatmeal. It was like cake for breakfast...and we know how much I love cake! I threw ingredients together so I wasn't sure how it'd turn out. Needless to say, I had to share it! In mixing bowl combine rolled oats, rocky road whey, cocoa powder, baking powder, sliced almonds, unsweetened chocolate almond milk, honey, vanilla extract, and eggs. Pour into 8x8 and bake at 350 for 20 minutes. I topped with some left over almonds, honey, and plain Greek yogurt mixed with cocoa and honey. So good!